Make yourself at home at TownePlace Suites San Antonio Downtown. 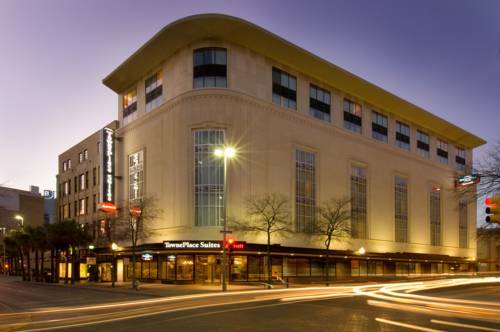 Our contemporary accommodations have a unique history, as the building was originally home to the Neisner Department Store and has now been transformed into our 117-room extended stay hotel in July 2010. Our hotel offers an unparalleled location near the citys most popular activities. Regardless of your length of stay, you can take advantage of excellent amenities in your suite, including a kitchen and a comfortable work area. Enjoy a match of tennis with our partner, the San Antonio Tennis Association. Keep connected with complimentary Internet access, or unwind in front of your flat-screen TV. Hosting events and meetings at our hotel is stress-free, thanks to our experienced planning team. Our most convenient amenity is our excellent proximity to downtown San Antonio - from shopping and dining at the River Walk to the history and significance of the Alamo. It's all within your reach at TownePlace Suites San Antonio Downtown.